After listening to a lecture on fishing our northern neighbor given by Harry Robertson, international fly fishing guide and owner of Hanover Fly Fishers near Richmond, Virginia, I decided to book a trip to Labrador. Harry has been guiding for over fifteen years in conjunction with Cooper’s Minipi Lodge, an establishment that specializes in putting eager anglers on to large brook trout. On a good week, anglers here can expect to catch dozens of brook trout that easily exceed three pounds each. 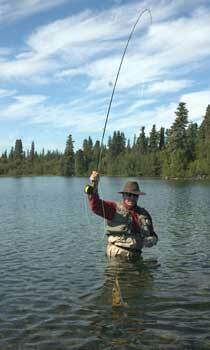 During the week that I spent in Labrador, my fellow anglers took several trout over five pounds and two brookies that exceeded 7 pounds each. Although I was excited at the prospect of landing giant brookies, I also found myself drawn to one of Canada’s best kept secrets: pike on the fly. The pike has the dubious distinction of being nicknamed the water wolf. This nickname is well deserved, for the Canadian pike is as close to a finned wolf as one can (or should choose to) get. These fish can easily exceed three feet in length, and fish over five pounds are not uncommon. 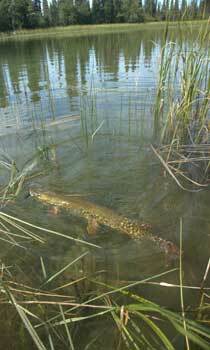 Pike are the consummate ambush feeders and prefer to lie in wait for their prey rather than patrol. Like a stealthy, camouflaged soldier waiting in silence to take its enemy by surprise, the pike’s coloring works to its advantage: it has a combination of green, yellow, and black streaks that run vertically along its sides. This special coloration affords the fish the opportunity to blend in with lily pads and aquatic vegetation. By the time most fish see the pike, it’s already too late. Pike are known for their voracious appetites and their violent takes. The first pike I took on my trip was quite by accident. I had been wading in a small river and had been taking nice brookies most of the morning with a small mouse pattern. When I came to a large pool between a series of runs I made another cast and an enormous hole opened in the water. I was startled by the dramatic take of my fly, but I automatically set the hook. My Fly Logic rod bowed in respect as the pike made a run back to the deeper part of the pool. I quickly tried to turn my fish to keep him from dragging the line over sharp rocks. After a lengthy tug-of-war (or so it felt to me at the time), my first pike came to hand; naturally I was as proud as a peacock. My guide snapped a few rapid photos for posterity, and I released my water wolf back into the river. When considering gear for pike, think saltwater fishing: larger rods are a definite plus. Eight- to ten-weights are the rods of choice because anglers are generally throwing into heavy cover. As soon as your prey realizes that he’s the one who has been ambushed, he’ll head for the thickest part of the lily pads, pronto. Use wire leaders when possible, but heavy mono will do if you don’t mind changing leaders after every other fish. You should use no less than 2x leader. And don’t worry about the wolf; pike fear nothing in the water but man, so a four-foot leader and a foot of tippet are all you need. Flies that have a big profile or cause a lot of commotion on the surface are the order of the day. When I say big flies, I am referring to size #2 and larger. Harry Robertson related to me his philosophy on pike flies, which is fairly straightforward: “Find a fly the size of a small chicken, cast it on the corner of the lily pads, strip it, and hold on.” Initially I thought Harry was joking when he told me that the arch nemesis of the Canadian mother duck is the pike—and then I remembered the slide I’d seen during his lecture of a pike that had eaten a squirrel! Pike do pose a special problem for fly anglers; they are bold fish, and they tend to swallow the fly deep into their gullet. To avoid toothy encounters while removing flies, it’s best to keep in mind the shocking speed of these fish. As soon as you see the slightest wake, disturbance on the water, or flash of the pike’s side, strip as fast as you can. The pike will still get the fly, but it will be lodged in the corner of his mouth rather than halfway down his throat. If you manage to catch one of these ferocious fish, try to pick him up carefully but firmly behind the eyes. Once you are sure of your grip, pull the fly out as best you can. If your fingers are precious to you, I suggest you use forceps during fly removal. A fishing trip to Canada has rarely been more feasible. The U.S. dollar remains strong against Canadian currency, which certainly makes the cost of such a trip much more appealing. English is widely spoken, and Canadians are friendly, welcoming people. Canada (and Labrador in particular) is a pristine land offering majestic landscapes, unbeatable outdoor adventure, and fabulous fishing. With preparation and a little bit of luck you’ll make Dudley Do-Right proud and always get your pike. For more information on fly angling for Canadian species, contact Harry Robertson at Hanover Fly Fishers (804-537-5036; cvupla@earthlink.net) or Cooper’s Minipi Lodge (709-896-2891; http://www.minipibrookies.com). For general information on travel to beautiful Newfoundland and Labrador, Canada, contact Ed Best at the Newfoundland and Labrador Department of Tourism (888-563-6353; http:www.gov.nf.ca/tourism). Beau Beasley is an avid fly angler who lives with his wife Leila and children in Warrenton, Virginia. When not out fishing he serves as a captain on for Fairfax County Fire and Rescue Department on Engine 427 in West Springfield, Virginia.